Sage, or Salvia officinalis, is an aromatic, perennial herb that grows easily in warm, dry climates. A sturdy, long-stemmed herb, sage is easily dried by air drying in a warm, dry room, or with a microwave oven or food dehydrator. You can also use your home oven to dry sage quickly and evenly. Store dried sage and use it to season soups, salads, meat, poultry or stuffing, or steep the dried leaves for flavorful tea. Preheat the oven to no higher than 180 degrees Fahrenheit. Rinse the sage gently under cool water. No washing is necessary if the sage is clean and hasn't been exposed to pesticides or herbicides. Just shake the sage to remove dust or loose leaves. Strip the freshest leaves from the sage. Discard coarse stems and dry, wilted or damaged leaves. Arrange the sage in a single layer on a cookie sheet. Place the cookie sheet in the center rack of the oven. Prop the oven door open a few inches to provide air circulation and prevent the oven from becoming too warm. Stir the leaves with a long-handled spoon every 30 to 60 minutes to promote even drying. Allow the sage to dry for three to five hours, or until the leaves are completely dry and crumbly. 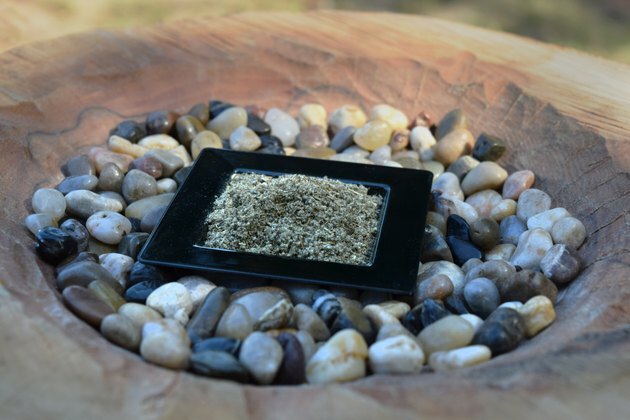 Place the dried sage in an airtight glass or plastic container or a resealable plastic bag. Be sure the leaves are completely dry. Otherwise, mold may form on the leaves during storage. Store the dried sage in a dark, cool, dry place. When properly dried and stored away from heat, moisture and light, sage lasts up to one year. Store dried sage in very small quantities to keep the herb fresh. Every time you open the jar or bag and expose the sage to air, the quality of the dried herb is diminished. University of Illinois Cooperative Extension; Harvesting and Drying Herbs; James C. Schmidt, et al.